Toastmasters Speeches: Resources for Entertainment-Sample Speech, "That Extra Mile"
Way back when I was 24 years old, I had a wonderful opportunity – and that was to go work in the United States for 3 months. The US office for the company I worked for needed temporary help to finish a critical system in the US. Being one of the more senior programmers in the Philippines office, I was selected to assist in the project. I was excited! And why not? I was young and it was my first time to ride a plane, go abroad and to the United States at that! I had a month to prepare. The name of my boss at the US office is Bala - short for Balakrishnan. From his name, I imagined that he was from India. Towards the end of the month, Bala sent an email. He said he’ll pick me up at the San Francisco airport when I arrive. I answered, “Great”. On the day of my flight, I was ready. I was wearing cargo pants. Do you still remember what cargo pants are? Cargo pants have several side pockets so huge you could put dinner plates inside. Inside the right leg pockets were my travel documents and email printouts about the trip and the assignment. In one pocket were photocopies of these documents. In the other pocket, a second set of photocopies. Yes. I.. WAS.. READY. After the 15-hour flight, I finally landed at San Francisco International airport. Passing US immigration was a breeze. Like I said, I was ready. (Walk) When I got to the arrival area, it was packed! There was a small crowd waiting and some people had placards with names on them. You’ve seen those people at airports holding placards with names of their visitors, yes? Well I saw a guy holding a placard with my name on it! And immediately, I felt I was a VIP! But the guy holding the placard wasn’t Indian at all. No, he was white, an American with gold brown hair! Maybe my boss was really an American with and Indian name! Thinking Bala was searching for me, we decided to wait. After 30 minutes, still, there was no Bala. I was dismayed. I showed Jim the address of the apartment where I was to stay and asked if he could at least take me there. I knew it wasn’t his job to do that, but I was desperate. Then I said, “Mr. Jim, I don’t have much driving experience. This is my first time in this country and I don’t know anyone here. Please help me.” Jim looked at his watch. It was 11 in the evening. He looked at the address for a long long time. And then he looked at me, smiled, and said “Let’s go.” And we left the airport. (Walk) At first, the trip from the airport seemed forever. While he was driving, Jim noticed that I was very quiet and worried. He engaged me in a light conversation and asked about me, my job, the Philippines. We even had a few laughs along the way. After an hour and a half we reached the general area but we cannot locate the exact address of the apartment. It was already very late and Jim suggested I check-in to a motel for the night and then call my US office the following day. Jim helped me check-in the motel. Once inside, I realized that I had Bala’s home phone number also. We called up Bala from the motel and then I learned that he looked for me at the airport but we simply didn’t see each other. Bala promised to pick me up the following day from the motel. Jim didn’t charge me a cent and before he left, I thanked him profusely. And for the first time, I was relieved – able to finally rest and sleep. I never forgot about Jim and after my 3-month assignment, I decided to call him before I took my flight back home. The receptionist who answered at the San Francisco branch said that Jim no longer worked there and asked me who I was. I told her my name and said I was a satisfied customer. The lady became quiet for a while and said that they missed Jim. 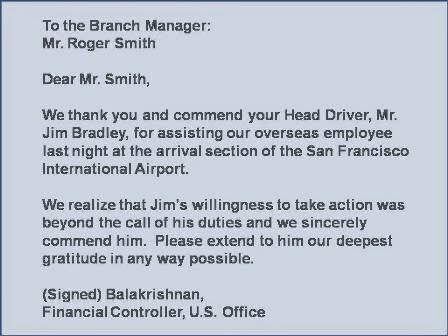 She said Jim had to be transferred because he was promoted from Head Driver in San Francisco to become Manager in the new Sacramento branch. I was so happy for Jim. On the plane trip back home, I recounted the events and realized that the story to tell - this story - isn’t about me. No, this story is about Jim Bradley, an exceptional man who demonstrated exceptional customer service by going to that extra mile.